Digital transformation is hitting all industries today, and BioCatch is supporting these initiatives with stronger security and enhanced usability on web and on mobile. 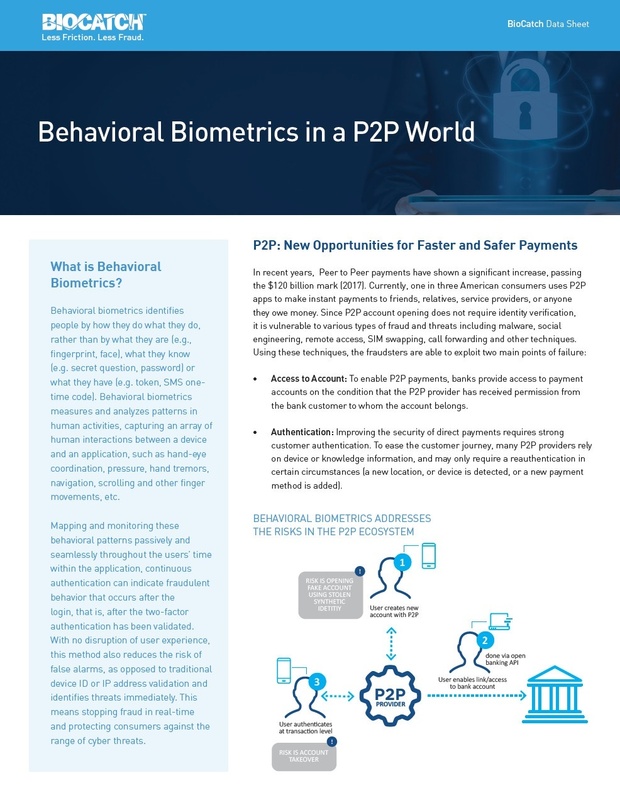 Learn about our behavioral biometrics solutions for banking, insurance, payments and more. BioCatch’s behavioral biometrics platform is a cloud-based solution proactively detecting human and non-human behavioral anomalies. 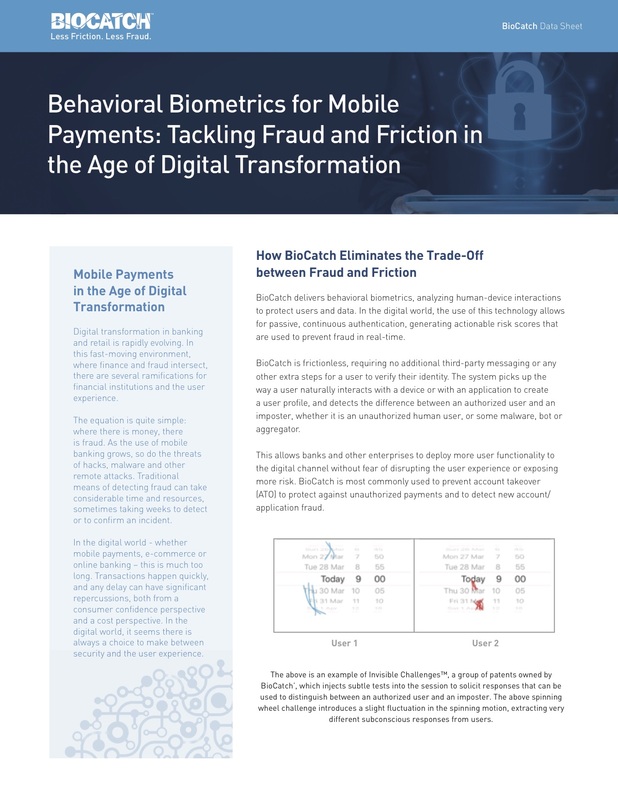 Focusing on preventing fraud while providing online and mobile users with a frictionless experience, BioCatch’s solution offerings validate identities and identify new account fraud, account takeover, and account or license sharing. BioCatch selects 20 unique features from its 2000+ patented behavioral profiling metrics to authenticate a user — without any disruption in the user’s experience. Going beyond standard protocols for identifying an authentic user or detecting malware, bot or RAT activity, BioCatch behavioral biometrics is a powerful holistic approach to cybersecurity, providing strong authentication while minimizing false alarms. BioCatch helps banks identify and prevent new account fraud and account takeover without disrupting customer experience, driving tremendous return on investment by saving on actual fraud losses and operational costs in managing the fraud. Our platform secures an inefficient ecosystem with multiple vulnerabilities to stem card-not-present, account takeover, and new account fraud across mobile and web channels. 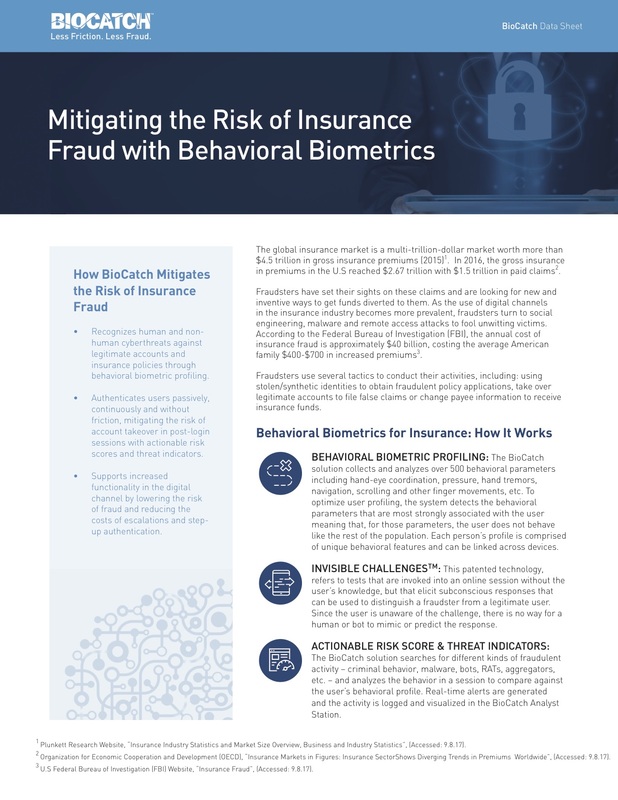 BioCatch helps insurance companies fight all the different faces of fraud, preventing the use of stolen or synthetic identities to obtain new policies or account takeover fraud in submitting claims. Fraudsters threaten online trading, e-commerce, and e-learning industries as well as government and enterprise security. Go beyond standard cybersecurity protocols with behavioral biometrics.